These updates aren't necessarily related; there's just a lot happening in my life right now. 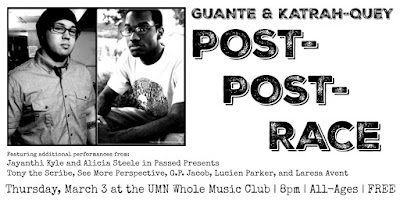 First off, I just made the pre-order live for the new Guante & Katrah-Quey album, "Post-Post-Race." 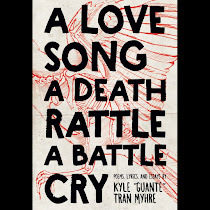 If you preorder it, you get an instant download of my FAVORITE new song from the project: "Our Relationship is a Slowly Gentrifying Neighborhood" featuring the incredible Jayanthi Kyle! And don't forget: our release show is coming up on Thursday, 3/3 at the Whole Music Club, and it's going to be something really special. All of the performers are also guests on the album, and they're all people I have endless respect for both as artists and as people who "walk the walk" when it comes to the issues that the album is tackling. Check out the Facebook event page here. It's free and all-ages too! This would normally be a separate post because getting a poem up on Button's channel is a pretty big deal, but like I said, these are tumultuous times so I'm just going to put this here. They got footage of my poem "Small Talk" from Sierra DeMulder's book release show. This is a very personal poem I wrote about art, identity, and profound introversion. If you missed it, I have ANOTHER new poem up at my own channel, brand new footage of "The Invisible Backpacker of Privilege," which is a great introduction to the themes explored on the new album. Finally, a reminder that the Be Heard MN Youth Poetry Slam series is heading into semifinals this month-- 3/5 at the Loft Literary Center, and 3/12 at the MacPhail Center for Music. Finals are coming up too-- 3/26 at the Walker Art Center. All three of these shows are going to be amazing; I've said it before but it bears repeating: these young artists (all between 13 and 19) are mind-bogglingly talented, and deserve our support!